Retailers have gotten a lot right when it comes to differentiation in the e-commerce landscape, vastly improving the speed at which shoppers can purchase the items they want and when they want them. Yet, retailers all face a unique challenge that can’t be fixed with just a better UX — fostering and sustaining customer loyalty in an increasingly crowded market. Loyalty’s primary function is to give shoppers a compelling reason to become repeat customers. It’s also ultimately driven by two things: A positive experience and engagement that encourages them to return. Research from Forrester indicates that there is a direct correlation between customer experience, loyalty, and the ability to increase sales, AOV and conversions. To achieve those goals, retailers must learn what type of experience their customers want when they land on their e-commerce site and what can be done to encourage better engagement, each of which contribute to greater loyalty. We’ve drilled down into the three primary tips to help retailers effectively apply customer loyalty strategies. One of the most overlooked aspects of loyalty is the connection to the ease of an e-commerce payment ecosystem. Paying online often comes with added friction since customers are traditionally asked to fill out lengthy forms with a host of personal credentials, slowing down the purchase process. A recent report from Braintree — a PayPal company — indicates that 27% of shoppers have cited a clunky or slow checkout as the reason for abandoning a purchase. There’s a reason that the wider adoption of Amazon’s once-patented one-click checkout option has received so much buzz in the retail community. By incorporating payment processes that eliminated the need to input extra customer data — including credit card numbers — Amazon empowered customers to checkout faster, thus increasing conversion rates. Industry data shows that top-performing retailers all have one thing in common: Faster checkout times. An effective online payments strategy can also be streamlined by showcasing diverse payment methods earlier on in the checkout process. Innovation across the payment technology landscape has transformed how merchants can leverage alternative payment options as an effective loyalty-building strategy. Therefore, instead of simply offering credit and debit payment options, or feeling confined to digital payment options like PayPal, loyalty can be bolstered by offering additional payment options such as financing. Financing empowers customers with the knowledge that they can checkout and pay over time, on their own terms. Payments shouldn’t be an afterthought on your e-commerce site; the process should be fully visible, transparent and used as a way to indicate to shoppers that they are in control of their purchase experience. The concept of point-of-sale financing has become revolutionary for merchants that want to tailor payment options to their customers. For instance, retailers that incorporated financing at the point of sale have substantially increased their average order value. AOV, similar to the streamlined payment experience we outlined above, can be directly tied to customer loyalty. However, not all financing solutions are created equal. The benefit of the right financing solution should be its integration into checkout—even as early as a product page. Loyalty is like engagement (which we discuss in tip #3 below) in that it’s most effective when applied earlier in the funnel, which means customers should be presented with a payment option long before deciding to complete a purchase. Alternative payment options should be viewed as a way to drive conversions and boost loyalty. Otherwise, retailers face the risk of losing a future loyal customer based on their inability to provide flexible payment options. The good news is that there are white-labeled financing options that can be easily integrated into e-commerce platforms, allowing customers to pre-qualify for financing before they even add items to their cart. This empowers customers with greater purchasing power, while enabling them to create a better connection with retailers. 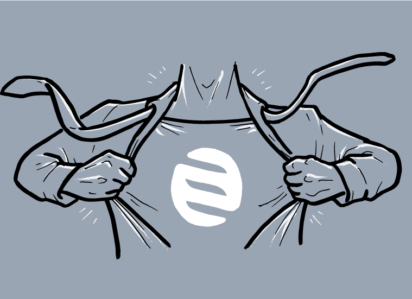 Better yet, it builds loyalty directly into the payment experience. There’s a middle ground that can be struck between bombarding shoppers with emails and targeting customers with fewer touchpoints at just the right time. Personalization, a major piece of any engagement strategy, is key to finding the right formula to turning an ordinary shopper experience into sustained loyalty. Shoppers who feel that a retailer is meeting their needs are more likely to build an authentic connection to that brand. In Bread’s case, The RTA Store has served as an informative case study of loyalty through enhanced engagement strategies. 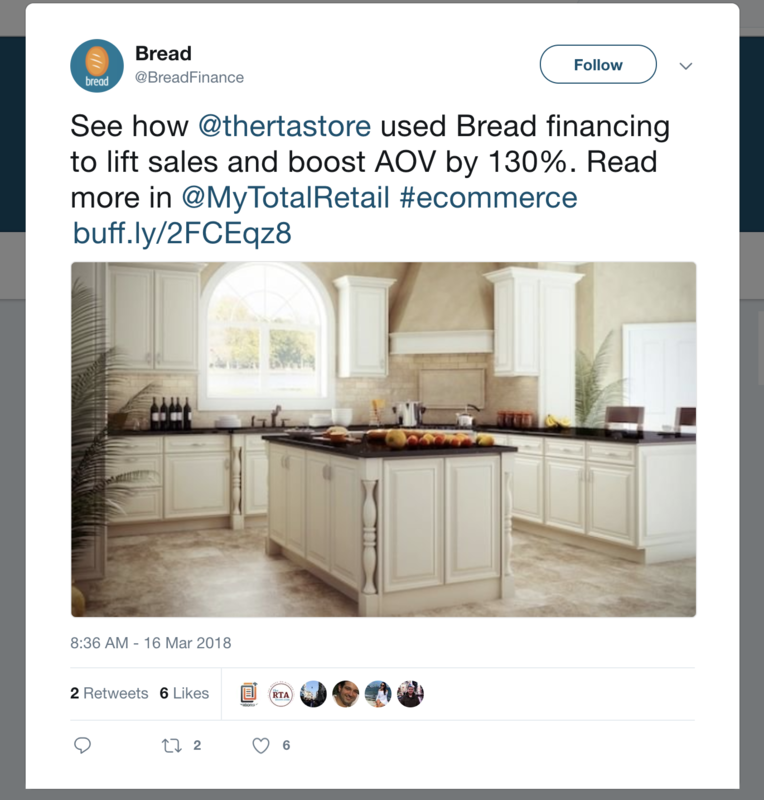 The RTA Store partnered with Bread and Listrak to programmatically include financing offers in retargeting emails. 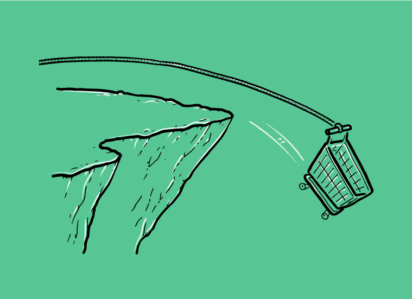 The specialized cabinet company A/B tested its standard cart abandonment email series against a personalized financing offer series. What they found was that the personalized emails resulted in an impressive 86% increase in AOV, a 155% increase in revenue per email, and a 38% lift in click-throughs. This case study showed that while retailers often implement tactics focused on the top of the funnel, such as customer experience, a clear website interface and solid branding (to varying levels of success), they often neglect to factor in how high-level personalization can turn casual perusing into loyal, repeat customers. The right personalization strategy matters — it delivers that subtle, extra surprise and delight factor that’s importance to driving conversions cannot be underestimated. To get this process started, merchants must provide offers through multiple channels. This can be done through email marketing, on-site promotions, or external ads (i.e., social and search). Each of these channels serve as valuable tools to improve brand relationships and engage shoppers deeper into the sales funnel at a faster pace. The result is that new customers feel engaged and understood and past customers are reminded to re-engage with a brand. Merchants can also drive up loyalty by being one step ahead of the customer based on their past purchases or browsing habits. Offers, as we mentioned with The RTA Store, can be tailored through targeted methods as a way to personalize the customer journey — all while keeping the brand top of mind. In a sense, you end up playing matchmaker — customers connected to products that correspond to their preferences drive up AOV and conversions. For example, Amazon reported 35% of its revenue stems from leveraging its product recommendation engine. E-commerce merchants that want to translate engagement into loyalty need to go beyond delivering the traditional customer experience of sufficient navigation and minimal touchpoints during the early stages of the customer journey. 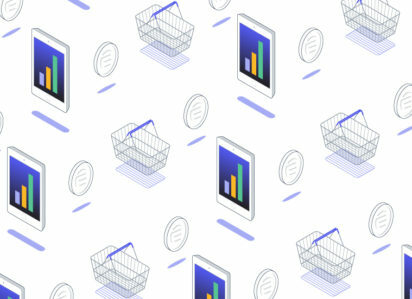 Through better payment experiences, more diverse payment methods, the introduction of financing earlier in the checkout process and multi-channel engagement, merchants can be better equipped to boost brand loyalty over the long-term. This can also trigger repeat customers who are more likely to convert and help drive one of a retailer’s most valuable revenue generators. Of course, no retailer can tackle this alone. Fully executing an effective customer loyalty playbook means learning what types of payment options are best for your shoppers, taking advantage of third-party payment technologies to keep customers engaged, and then using this knowledge to craft a repeatable, scalable loyalty program with prospective and current customers. No easy feat, we know. However, with the right resources and checkout partners, retailers can be well on their way to crafting personalized loyalty strategies suited to the evolving needs of their customer base.